BRAND NEW FORMAT! 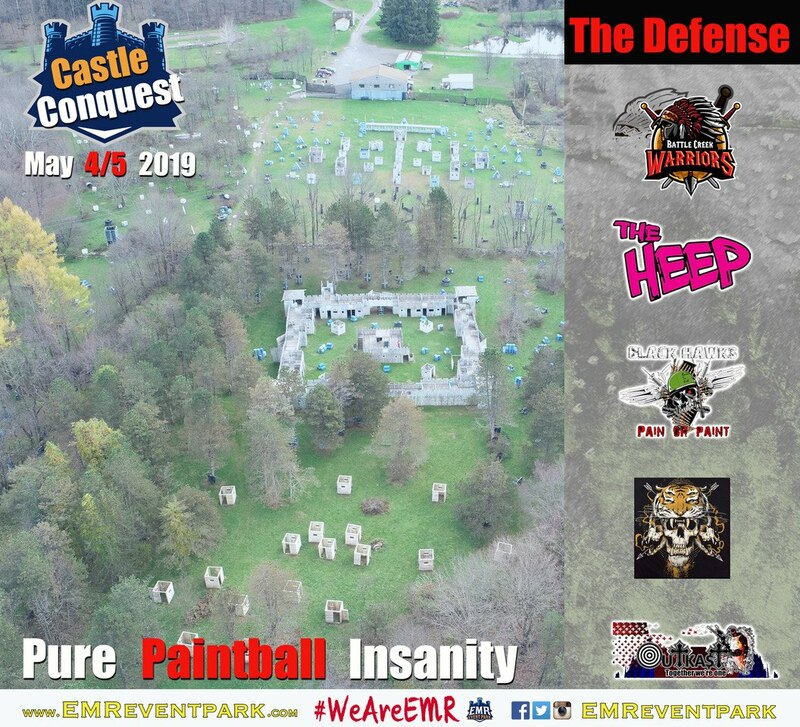 Come Play the CASTLE ECLIPSE CONQUEST Saturday in the LONGEST RUNNING and BIGGEST ATTACK & DEFEND Game in Paintball that purely defines the words “PURE PAINTBALL INSANITY”. CASTLE CONQUEST brings you CONSTANT INSERTION, MORE OBJECTIVES, and STARTS with an ATTACK/DEFEND Battle in VALKEN TOWN and continues out onto the field with BATTLES FOR 10 KEYS to open the Castle Doors, including THREE SECRET DOORS! The CASTLE Defense will be lead by Kevin “DEATH” Foley and his team BC WARRIORS and they will be joined by Team HEEP as well as BLACKHAWKS, TIGERS, and OUTKAST in their Valiant Defense. Sunday brings you a Brand New Game “SUNDAY SLUGFEST” created by Tim Hanley that offers another Adrenaline Packed Day of Play. 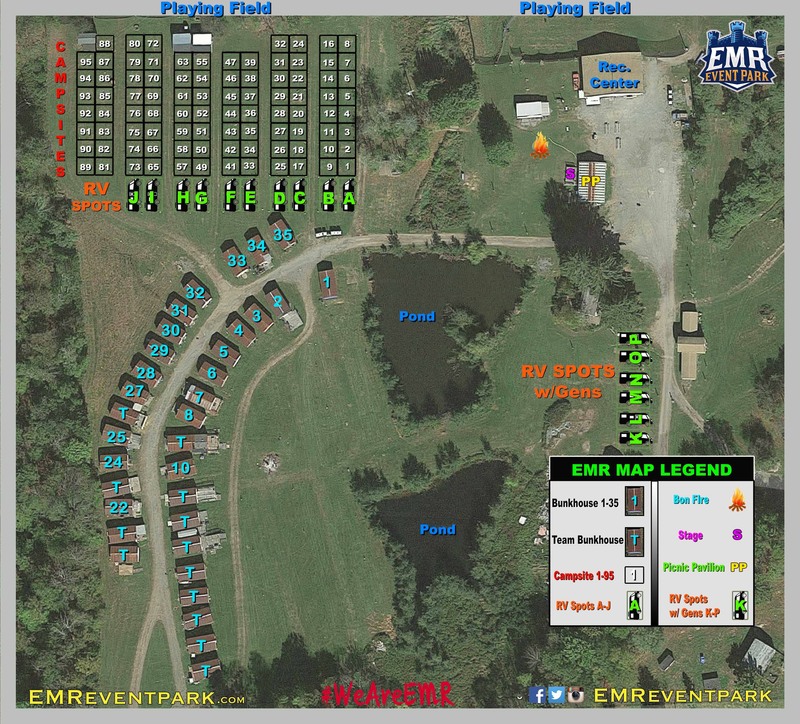 EMR IS FIELD PAINTBALLS ONLY so that we can Constantly Strive to Improve and Add More to our Facility for Our Players. SPECIAL ENTRY/PAINT If Pre-Regged by 4/21/19, is $149 and includes ENTRY and Two CASES of VALKEN PAINTBALLS. ENTRY ONLY If Pre-Regged by 4/21/19, is $40 and includes the entire Weekend of PURE PAINTBALL INSANITY, Unlimited Compressed Air or Maximum of two CO2 Fills per Hour per Person, or the Standard Rental Package consisting of a TIPPMANN Semi-Auto Marker, Goggles, C/A Bottle, and unlimited C/A. HERO ENTRY DISCOUNT If Pre-Regged by 4/21/19, is 25% OFF for All Active and Veteran Military, Police, and Fire Fighters from the US and Canada. Must Show Valid Hero ID when Checking In. Pre-Regged Players that Request Defenders Spots will be guaranteed a spot on the Defenders. After that they will be put on a Waiting List to see if the Number of Players on the day of the event require more Defenders to keep the Odds at 4 to 1. VALKEN PAINTBALLS If Pre-Paid by 4/21/19, are $65 per Case of 2000 and $20 per Bag of 500. SPORTS SMOKE If Pre-Paid by 4/21/19, is at the Discounted Price of $10.00 ea or 6 for $58 for the Tactical Smoke Grenades (TSG) and $21 ea or 6 for $120 for the Battlefield Smoke Grenade (BFG). RENTAL UPGRADE If Pre-Paid by 4/21/19, is $20 for an Eclipse Etha, Electronic Hopper, and 3000 PSI HP Tank. Limited Quantities! AFTER 4/21/19 UNTIL 4/28/19, Entry is then $45, Case of Paint $70, Bag of Paint $22.50, and Sports Smoke & Rental Upgrade Purchases are Only Available at the Event. ENTRY AT THE EVENT is $50, Case of Paint $75, Bag of Paint $25, Sports Smoke TSG $11, Sports Smoke BFG $22, and a Rental Upgrade is $25 as available. Chrono and Arm Banding for Defenders starts behind the Rec. Center. Compressed Air Stations, CO2 Stations, Paint Sales, OPEN FOR BUSINESS. Safety Orientation and Game Rules Given for Attackers at Stage. BUNKHOUSE Lodging costs $10 Per Person to stay in for the Entire Event if Paid For by 4/21/19 and should be reserved in advance with Pre-Registration to guarantee a spot. After 4/21/19 each bunkhouse spot is $15. To reserve Your Own Private Bunkhouse, the cost is $100 for the Entire Event if Paid For by 4/21/19 plus a Refundable $50 Deposit and should be reserved in advance with Pre-Registration to guarantee a Private Bunkhouse. After 4/21/19 it is $125 plus $50 Deposit. CAMPSITES for Tents and Campers are 20’ x 20’ and Cost $10 Per Campsite for the Entire Event if Paid For by 4/21/19. More than one site may be reserved at $10 Per Site. After 4/21/19 Each Site is $15. RV SITES are 20’ x 40’ and Cost $20 Per Site if Paid For by 4/21/19, however there are no water or electric hook-ups for the RVs. You must notify us if you wish to run a Generator past Midnight and if so, you will be assigned a spot apart from the Campgrounds. Walk-on players are not guaranteed Campsites or RV Sites. After 4/21/19, RV Sites are $30 Each. Game FPS is 280 FPS. No Dead Man Walks are allowed in this game. No Barrel Tags are allowed in this game. No assassins allowed to be used on the other team. No directly shooting through a crack or opening in the walls of Castle Eclipse less than 4” wide unless you are at least 5’ from the opening. Splatter does not count by paintballs. Grenade hits must amount to more than an accumulation of a quarter coin size. There is Constant Insertion for both Sides. ONLY SPORT SMOKE is allowed to be used at EMR and cannot be thrown inside or within 20’ of the Castle Walls. The CASTLE ECLIPSE Defense will be lead by Ken “DEATH” Foley and his team BC WARRIORS and they will be joined by Team HEEP, BLACKHAWKS, TIGERS, and OUTKAST in their Valiant Defense. For any other players that wish to defend, Only the First 65 Players that register to Defend will begin as Defenders. Anyone else that wishes to Defend after the first 65 slots are filled will be put on a Standby list and should check at the Rec. Center at 10:00 am the morning of the event to see if they have been added in as defenders. For the SUNDAY SLUGFEST Game on Sunday, Players will be divided into the two teams as they check in Sunday morning. We need a leader for the Attackers for CASTLE CONQUEST and Leaders for both sides for the SUNDAY SLUGFEST Game. If interested, contact Tim@emreventpark.com . Any Defender that has not checked in and registered at the Rec. Center by 10:00 am Saturday will be dropped by the defenders list and replaced from the Standby list. Prize giveaways will be held at the stage on Saturday after CASTLE CONQUEST is over. All Prizes are supplied by the Vendors and EMR EVENT SPONSORS! CASTLE ECLIPSE is the second LARGEST, NASTIEST CASTLE that exists in paintball right behind CASTLE AAARRGH. With over 22,000 square feet of playing area within its walls, CASTLE ECLIPSE sports two full stories of playing throughout 8’ to 16’ deep ramparts completely encircling a courtyard of buildings, towers, and barricades. The corridors below the ramparts are full of staggered walls, windows, and doorways leading into the courtyard. With only 4 openings from the outside into the courtyard and two gang ramps from the Siege Machines onto the upper ramparts, this Castle is a FIGHT TO ENTER from Game On. Facing the Castle Front Wall (Considered WALL 1) is a wooded area full of bunkers and only 200’ from the front door is HYPER CORPS field backed by VALKEN TOWN, a large town with numerous buildings surrounded by numerous barricades and bunkers on all 4 sides and. To the right of the Castle is WALL 2 which faces CASTLE NUMBSKULL with woods, stone fences, and barricades throughout. The back wall (WALL 3) is faced with trees & bunkers throughout EGO VILLAGE. To the left (WALL 4) there is a mixture of trees, barricades, and buildings before hitting a downward slope. Castle Conquest will start promptly at 11:00 am Saturday morning and end at 6:00 pm Saturday Evening. Both Attackers and defenders will Chrono their markers behind the Rec. Center. Upon Chronoing, your ID card will be punched. Roving Chrono Refs will be checking speeds all during the event. CHRONO SPEED FOR THIS EVENT IS 280 FPS & ALL MARKERS MUST BE SET AT 12 BALLS PER SECOND OR LESS and ONLY PUMP or SEMI-AUTO is ALLOWED. The safety speech for the Attackers will be held at the stage beside the Picnic Pavilion and for the Defenders in the Castle Eclipse Courtyard. THERE IS CONSTANT INSERTION FOR BOTH TEAMS and ONLY DEFENDERS will be WEARING BRIGHTLY COLORED TAPE on Both Sides of their MASKS! The Game will Start with the Defenders located within VALKEN TOWN and the Attackers starting from their Insertion at TATTOO CREW COMPOUND. Attackers must drive the Defenders completely out of VALKEN TOWN before they can proceed further out into the Realm to locate and secure the 10 Keys Needed to Open The Entryways into CASTLE ECLIPSE.THESE KEYS WILL BE HUNG UP IN PLAIN SIGHT AND WATCHED BY AN EMR REF! Until they accomplish this, the Attackers cannot go past the boundary of TATTOO CREW COMPOUND or VALKEN TOWN and can only Respawn at the Tattoo Crew Compound Insertion. The Defenders can Respawn From anywhere within CASTLE ECLIPSE until the Attackers control VALKEN TOWN. After the Attackers Secure VALKEN TOWN, they can Respawn from either of the two designated Insertion Points located at Tattoo Crew Compound and beside the Rec. Center. The Defenders can continue to Respawn from anywhere within CASTLE ECLIPSE and at any Other Existing Key Site where the key is still hanging other than the one they were shot out at. The Attackers must then secure the 10 Large Keys Hung Up in Plain Sight and located throughout the Realm at the following locations: DEAD WATCH, HIGH GARDEN, TORRHEN, CASTLERY ROCK, EGO VILLAGE, FOXDEN, VALYRIA, BATTLEBORN, EYRIE, and CASTLE BLACK and turn them in at the Bone Taverne to Open the Four Ground Entrances and the two Upper Gang Ramps of Castle Eclipse before entering CASTLE ECLIPSE. Once the Attackers Open the Entrances and Ramps, the Defenders can only Respawn from their Dead Zone at the Corner of Walls 3 & 4 into the Castle Itself. The Attackers must then retrieve the 10 objectives inside CASTLE Eclipse and turn them in at Bone Taverne by 4:00 PM to be Victorious. The 10 Objectives are the: ROYAL PLATTER, ALE KEG, EXCALIBER SWORD, PRINCESS ZEUSS, KING’S RANSOM, ROYAL KEY to the FRONT GATE, BLUE’S CRYSTAL BALL, EMR’S COAT of ARMS, BLUE’S ROYAL STALLION, and BLUE’S ROYAL CHALICE. If the 10 Keys have been secured and turned in to the Bone Taverne by 1:00 PM, a Secret Door into the Castle will Open. Then Another Secret Door will open at 2:00 PM and a Third Secret Door will open at 3:00 PM. The attackers must retrieve the 10 Outside KEYS and at least 5 objectives from CASTLE ECLIPSE within the first five hours of the game or the defenders will be declared the winners. If the attackers retrieve 5 objectives from CASTLE WAR and retrieve the 10 Outside Keys within the first 5 hours of the game, then the game continues until all 20 objectives have been recovered. If the game is completed in less than 3 hours, another Attack and Defend Game will be held at Castle Eclipse 1 ½ hours later. Exact time will be announced. Players that want to defend the second game should report to the Rec. Center Store immediately after the first game ends. Players may only enter the Castle using the four ground entrances and the two upper gang ramps on the Siege Towers unless the additional hidden doors have been opened. PLAYERS CANNOT MOVE: barricades, boards, wooden structures, screwed together stacks of barrels, or spools. SUNDAY SLUGFEST is an Epic 4 Hour Battle Royale where Winning could come down to the last point. It will be held on VALKEN Town, HYPER CORPS, and in front of CASTLE ECLIPSE up to WALL 1. Slugfest Points start at 9:50 AM for every player that is in their start box 10 minutes before the start of the game at 10:00 am. There will be Timed Insertions for the first 2 hours every 15 minutes with a two-minute window. For every player in the insertion box during the closed insertion it’s 1 point for the other team. Starting at 12:00 Noon there is CONSTANT INSERTION for the rest of the game. 15-foot Engagement Zone that any opposing player with a marker may cross but must stay within the engagement zone. If the player goes further than the engagement zone that player will be eliminated. There will be 5 barrels scattered around each side of the battlefield that are worth points for every Ball inserted into them by the opposing team. The farther away the barrel is from their insertion, the more points that each ball inserted is worth. Barrel Points are as follows: Closest Barrels to Farthest Barrels will be 5,10, 20, or 25 points and marked accordingly. You must get your color ball in the barrel to count. Runners (Person with no marker) may go past the engagement zone to score points in any barrel. Anyone with a marker carrying a ball cannot pass the engagement zone. You can only carry one ball at a time but you can pass it to another player. If a person gets shot while carrying a ball they must drop it where they are and go back to their insertion. The opposing side may pick up the other sides ball and put it in the Neutral Barrel at their insertion and that ball becomes out of play. 25 balls per side will drop at the insertion every 30 minutes. DEAD MAN’S WALKS AND BARREL TAGS ARE NOT ALLOWED IN THIS GAME!